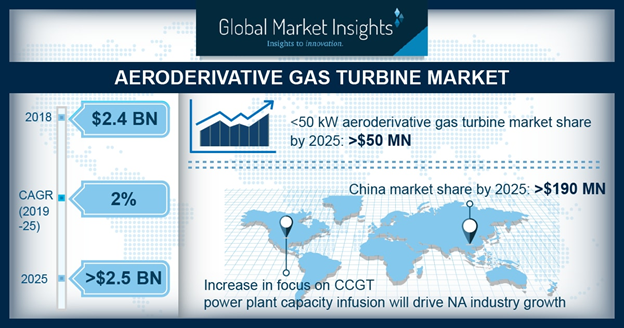 Aeroderivative Gas Turbine Market size will exceed USD 2.5 Billion by 2025, as reported in the latest study by Global Market Insights, Inc.
Aeroderivative gas turbine market, in the recent years has significantly been influenced due to growing energy demand from large-scale industrial units and associated manufacturing establishments. Demand & supply balance has constantly been a primary concern for private entities & various utilities which has further raised extensive fund flow toward the enhancement of renewable power generation units. Therefore, positive regulatory prospects aligned with increasing demand for effective & sustainable generating units will reinforce the industry outlook. North America market is predicted to grow on account of rise in focus towards combined cycle gas turbine (CCGT) power plant capacity addition. The rise in capacity is adhered to the development in drilling and extraction processes taking place across the region making gas-fired technology cheap & reliable source of power.